Every once and a while, something falls into my review pile that well, blow me away. 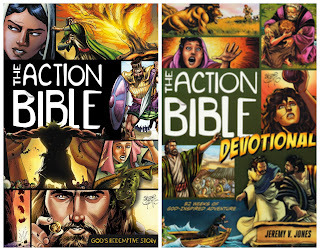 The Action Bible and the Action Bible Devotional are amazing. The graphic art - and trust me, it is art - was created by Sergio Cariello, an artist who has worked for DC Comics and Marvel Comics. Cariello's talent simply shines on the pages of both books. The artistry can match any graphic novel offering out there. It's solid, professional and classy. The writing is just a solid. This is a Bible that is cool. It gives boys (and girls) who like comics a Bible they can sink their teeth into in a new way. I've shown both the Bible and the devotional book to families I've worked with as a children's pastor. They love it. Knowing that boys - and parents alike - think this line is solid says even more to me. It has been especially popular with younger- and mid-elementary students. 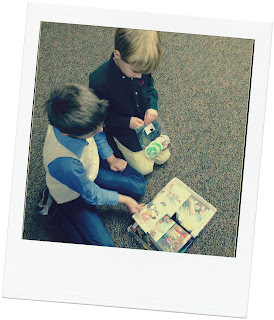 Knowing that boys want to share the book with each other, is another huge plus in my book. (As shown in an impromptu sit in the hallway discussion between two young boys at church). I think David C. Cook, the publisher, has hit a home room with these offerings. What sets the devotional apart, is that it not only includes the artwork from the Action Bible, but it also helps break the story down into five or six steps, to give the reader a chance to dive into it through a variety of methods. The story of Ruth and Boaz for example, pulls out a key verse, includes a short devo (X-Ray Vision) to relate it to present day life. The other steps help students not only apply it to their life today, but also take action steps to live out the meaning of the text. There's also room to answer questions (aka do a bit of journaling) to help make the process concrete. In all, I give these resources a solid five out of five. (A rare rating). I think if you are an adult, looking for a resource that introduces the Bible in a solid, kid-friendly way, then this is what you need. 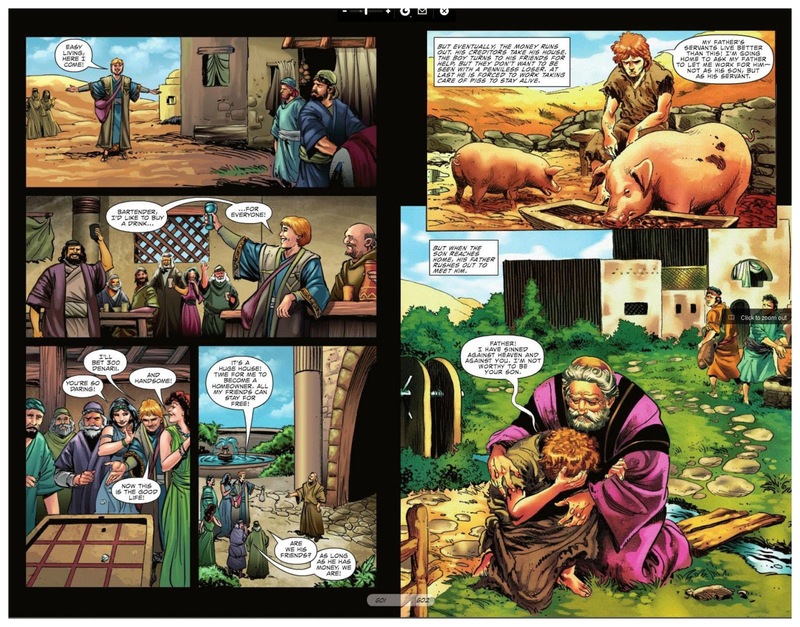 Honestly, if you are an adult who likes graphic novels, this might give you something to think about - to help you see the Bible in a unique way. (From The Publishers) Explore a life of adventure with God. Looking for adventure? With a week’s worth of activities for each Bible story, this one-year devotional gives you real-life ways to live out God’s spiritual adventure every day. Each week’s story includes: Key Verse (a highlight from the story you just read), X-Ray Vision (thoughts to connect the story with your life), Your Mission (three ideas to put the themes into action), Your Debrief (three questions to spark some brain cells), Mission Accomplished (your place to make notes). It’s all about faith in action as you dive into life knowing God is with you. So get ready to listen, draw, doodle, create, pray, and discover. The adventure awaits! 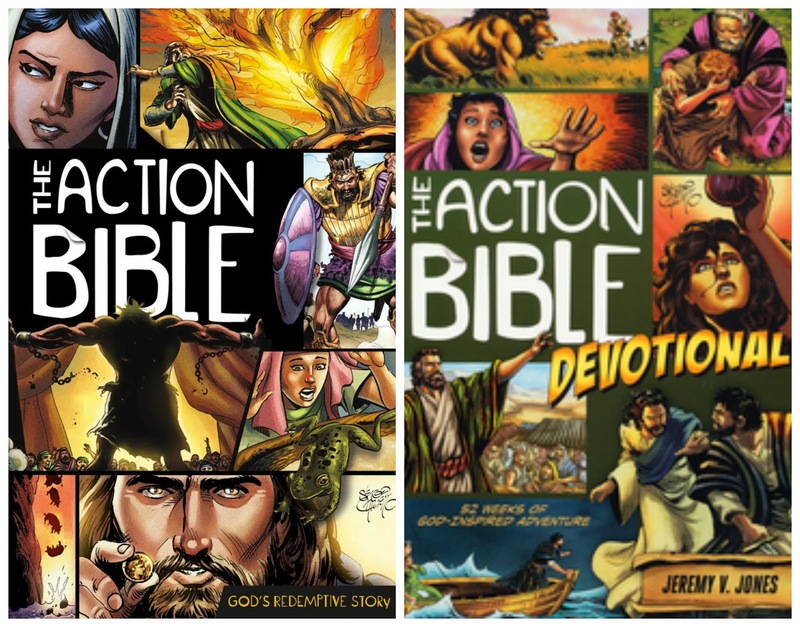 Note: As a freelance journalist, and children's pastor, I was provided a copy of the Action Bible New Testament & The Action Bible Devotional by the publisher. This review was not influenced by a free book - just in case you (or the FTC) were worried about this detail. Thanks for this helpful review Kaylea....I have heard nothing but good things about this Bible! I think my 4 sons (now all grown) would have loved it when they were young! Thanks Glenys - I hear "older" boys love it too... you might get it for them as a fun treat! The graphics are pretty incredible - if they like graphic art, they'll think it rocks! Scraps of Life: Plant. Grow. Serve.